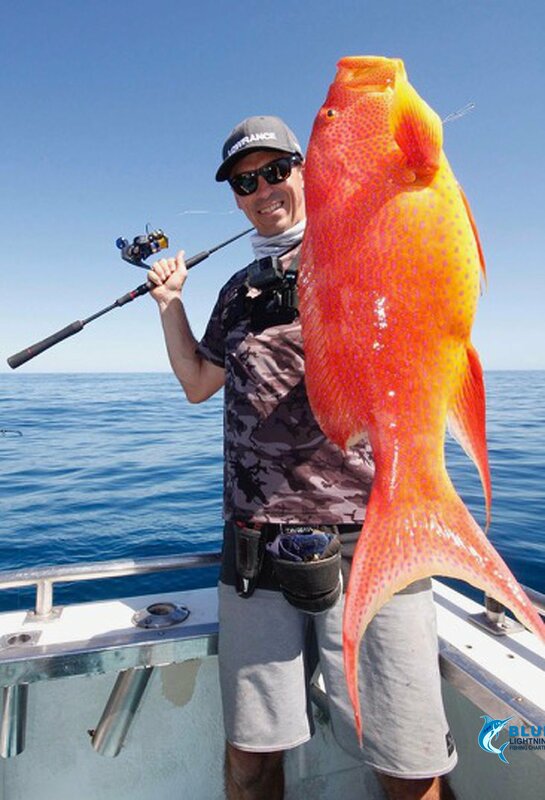 Sportsfishing at the Montebello Islands is a next level experience. 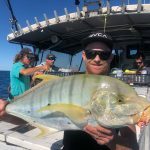 The variety of fish species up here is exceptional and there are plenty of challenging species just begging Sportsfisherman to test their skills. This week we had a group of semi professional sportsfisherman on board who have experienced Montebello Islands fishing with Blue Lightning a number of times over the years. Each was excited to try and beat their previous personal bests and to further explore the Montebello Islands. As is the nature of fishing, the weather doesn’t always cooperate. With unseasonal 30 knot winds blowing in the morning, it was agreed that we’d delay our departure for a short while to afford us a more comfortable transit between the mainland and the islands. The wind didn’t hinder us enough to dampen our enthusiasm as we enjoyed fishing our way across to Montebello Islands, arriving at the Blue Lightning pontoon not too much later than we normally would. The Montebello Islands turned it on for us on day 2 with some very nice weather, a great way to celebrate Jules birthday (even though he had a hangover). It was time for some Mackerel and bottom fishing. The crew cast poppers and stick baits at Mackerel. Steve scored 2 Spanish Mackerel and a sweet Rankin Cod for the day. In a day of personal triumphs and disasters, Damo began by losing his first 2 Mackerel to sharks. Never being one to let things get him down, he didn’t drop his bundle and was rewarded with a nice Golden Trevally. It wasn’t long before his luck nose-dived again as he lost two good lures! 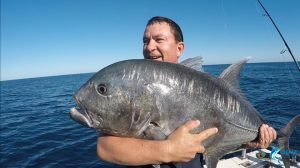 Still, he refused to accept defeat and rallied again with the highlight of his day being the capture of a big Rankin Cod that went on to take off the title of the biggest of the day. 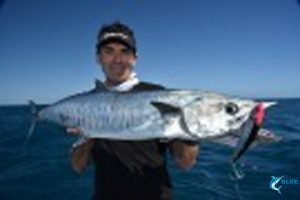 Simon lost 3 of his precious lures but scored himself 5 Mackerel and a Golden Trevally. For David, the day was far more upbeat. 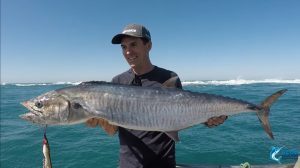 He reeled in 2 Squid and 2 Spangled Emperor (which were caught and released) from the pontoon in the morning before scoring 4 Mackerel later in the day, even though the biggest got away. Peter caught 4 Mackerel but managed to cut his finger during his “photo shoot”. He rounded out the day reeling in the head of a big Trevally L. For Jason it was all about the stickbaits on day 2 resulting in the capture of 3 Mackerel. After switching to bottom fishing, Jason scored himself a sweet Trevally. John was keen to really challenge himself and decided to fish without hooks to get the Mackerel REALLY jumping. He managed to catch 3 Mackerel deep divers for himself. Jules decided to make us all a beautiful dinner before we enjoyed birthday cake for dessert and an early night. Another great day of fishing occurred with a lot more laughs. 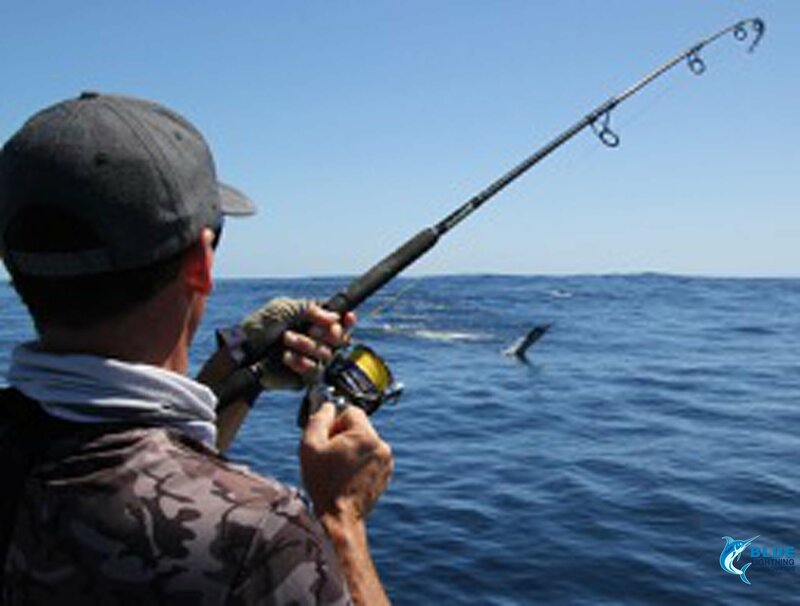 The sportsfishermen continued to trial both new and old tackle. Some disappointment but many more triumphs that left the guys tired from a day well spent but excited about the next days activities. For day 4 we started out bottom fishing. We hate overfishing so we move around to support healthy fish populations. With our new location reached we didn’t have to wait long for the excitement to get underway. Our blood began pumping when a Marlin swam past. 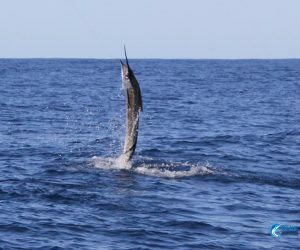 After a successful switch bait and a fun battle, Simon caught his first ever Marlin, a nice sized Black Marlin which had us all celebrating. The bottom fish were still not cooperating though with the big tides and a bit of swell turning them off. 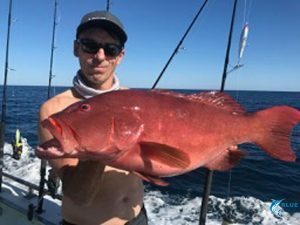 The crew managed to reel in some Rankin Cod but it was generally a pretty quiet session, a bit of an unusual occurrence at the Montebello Islands. The crew decided to try their hands at something different (after a little encouragement from Captain Chad) and the teasers and lures went in. The crew raised their first two Sailfish for the charter, unfortunately loosing both. Not to be deterred we kept trolling and raised two more. We switch baited both and the battle was on! 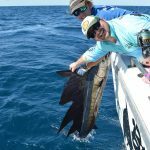 Peter pitted himself against a Sailfish and after plenty of fun caught his first ever Sailfish. John was also on the rod, battling hard and successfully catching and releasing a Sailfish himself. As our heart rates began to settle, our excitement levels rose again as a whale came up on the side of the boat and made one amazing noise! Next minute a dolphin was flying through the air at the height of Blue Lightning. It’s moments like these that you don’t easily forget, mother nature at its most awe inspiring. To round out the day the crew decided to go onshore and fish from the rocks. They were treated to awesome weather and outstanding fishing that left them sharing stories throughout the afternoon and into the evening. Day 5 and a cracker of a morning was upon us. We decided the best way to spend it was to engage in a serious billfishing session. We saw a Dugong on our way out wide. Birthday boy John caught the first fish for the day a nice Rankin Cod, before Jason caught a Coral Trout AND a Rankin Cod on one jig! Our favourite time of day, Billfish time and what a session it was! 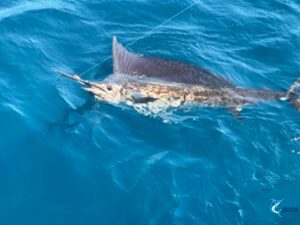 The crew had a number of 3 and 4 way hook ups, with plenty of Sailfish caught and released. 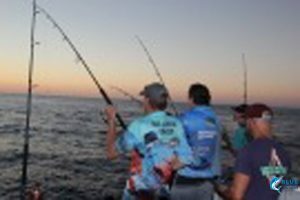 A 5 way hook up was next and it was organised chaos on the back deck of Blue Lightning III with anglers ducking and weaving to keep their fish on and their lines untangled. 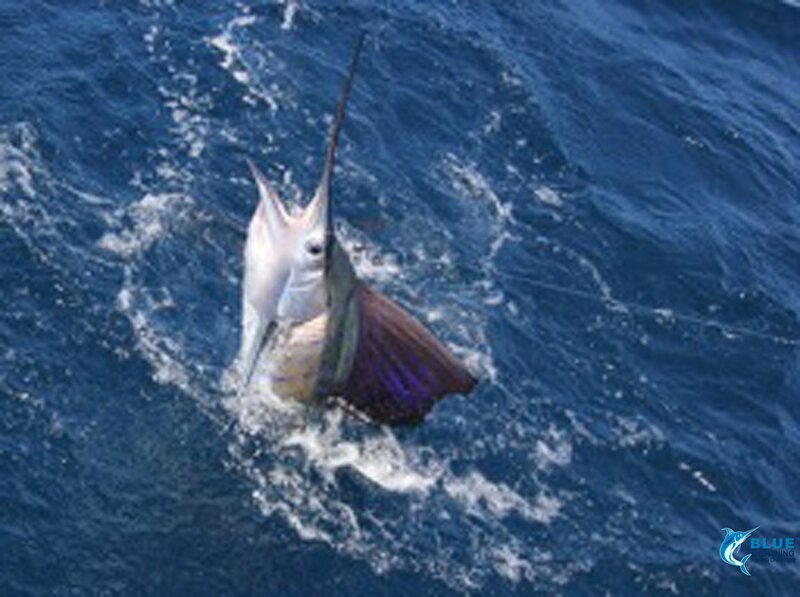 After some seriously impressive battles the crew landed ALL 5 Sailfish. 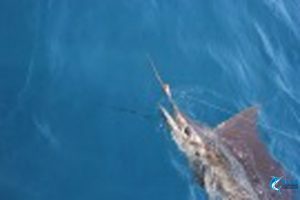 It was an awesome day of fishing for the whole crew with a total of 23 Sailfish! ? and a crew with smiles from ear to ear. This charter was flying by and day 6 was aready upon us. First up for the day was a jigging session with Jason catching a very nice Red Emperor. The crew were enthusiastic to have another attempt at billfishing. 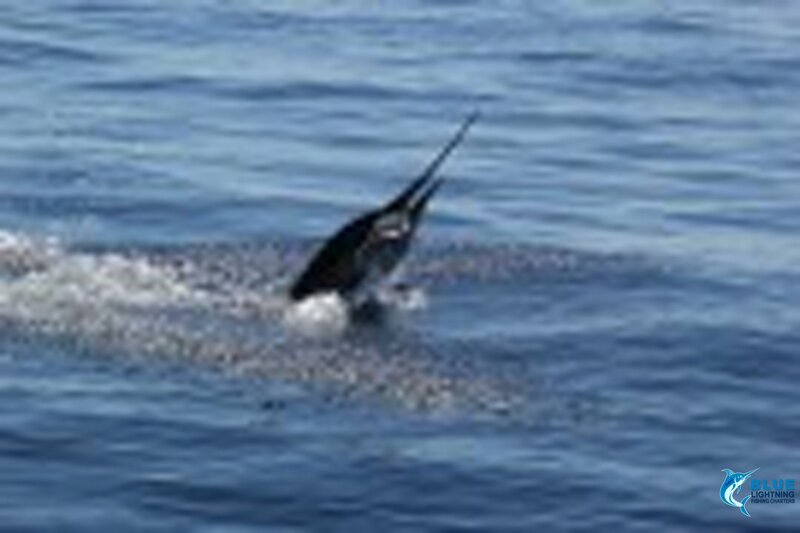 Damo was first up, battling a Sailfish before successfully catching and releasing it. Within minutes there was a pod of Sailfish and a 6 way hook up! Amongst the chaos and mayhem of weaving and ducking when 6 anglers are on, we’re happy to report all fish were landed. 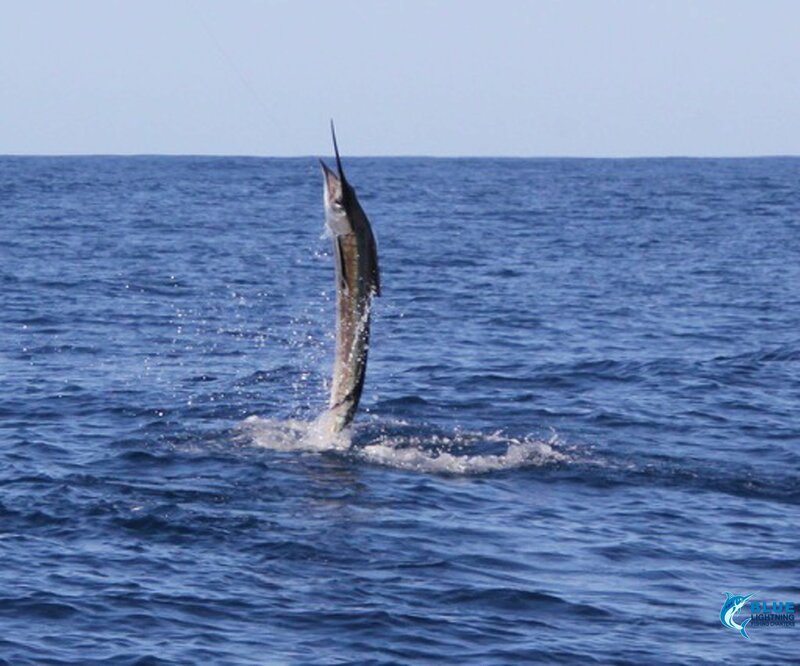 With our sixth day done and dusted we’d captured and released 21 Sailfish, making a total for 44 Sailfish in 2 days! 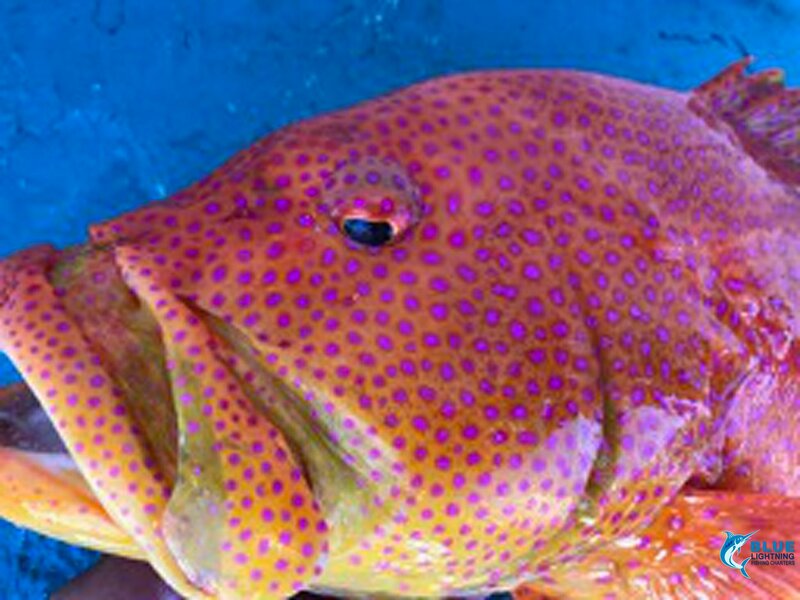 Jules- 1st Coronation Trout and 1st Maroon Sea Perch. The crew decided to have a couple of relaxed days around the islands, fishing and resting after everyone’s hard work billfishing over the previous two days. (I think we can safely say the we’d managed to wear everyone out!) Simon still managed to experience two personal highlights by scoring his first Queen Fish and then catching 2 Squid on a single jig. Not a bad effort! Day 9 came around so fast. It’s the day everyone dreads as we make our way back to Port. The journey home was filled with great stories being shared by the whole crew. After two epic days of billfishing and some typically awesome Montebello Islands fishing, these stories will continue to be shared for MANY years to come and we’re happy to say it’s what keeps bringing this great bunch of sportsfishermen back to our beautiful island home and we look forward to welcoming them back again soon. For more information on one of our incredible WA Fishing Charters to the Monties check out our Montebello Islands destination page here or contact us at via our contact form.